Are you looking to promote Grammarly and earn some extra income? If yes, then you have come to the right place because in this article I’ll talk about the Grammarly Affiliate program review. If you stick around till the end, I have also shared some golden nuggets on how you can promote Grammarly and earn extra money every single month. 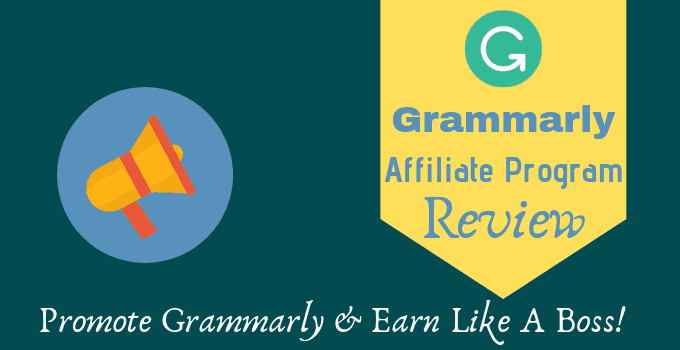 What is Grammarly Affiliate Program? How to Get Grammarly Affiliate $25 Activation Bonus? How to Earn Money by Promoting Grammarly as an Affiliate? How to Get Paid by Promoting Grammarly? Q1. I don’t have any prior affiliate marketing experience, can I apply? Q2. I don’t have a website or blog, can I join? Q3. Can I promote Grammarly in email or sending newsletters? Q4. How can I track performance and commissions? Q5. Can I use incentives to drive Grammarly signups? So, are you excited to promote the best online proofreading tool on the planet? Although you must be knowing what Grammarly is, but for anyone who doesn’t Grammarly is an online proofreading tool that checks for grammar, punctuation, and spelling mistakes. The tool works as a grammar checker helping you detect the copied content from all over the web. Plus it checks over 400+ contextual errors which you’ll find missing in other proofreading tools. It has two options to use. The first one is free which is known as Grammarly free trial account and the second option is a premium account which will cost you $29.95/month. Before you start promoting any products, you should be knowing the in and out of it. You should know how the tool can benefit your readers to solve their problems. Let’s look at some the Grammarly features which will help know you the tool better. Grammarly is the only tool that suggests you in-depth grammatical errors with over 90% accuracy. The tool will automatically find all the spelling mistakes in your document and address it to you so that you can quickly get it solved. Grammarly suggests you various punctuation errors like a comma, full stop, colon and semicolon error keeping the context of the sentence intact. Grammarly compares your document with over 16 billion web pages on the Internet to find out if anything is copied from those pages or not. If yes, the tool will detect it and send it to you. The tool suggests you proper sentence structure making your article look professionally written. Now that you have a clear understanding of all the Grammarly features, you are all set to promote Grammarly as an affiliate. Grammarly affiliate program is one of the best cost per lead (CPA) or pay per lead (PPL) offer that converts like hot cakes. Grammarly pays you affiliate income for even the free signups and if those customers upgrade to any of the paid plans, you earn higher commissions. If you know how to promote the Grammarly affiliate program the right way, let me tell you that you can make full-time income just by promoting Grammarly as an affiliate. Let’s break it down for you. Step-by-step. See, to begin with, any time you refer a new sign up to Grammarly they pay you $0.20 per free account signup. Now once they use the free version of the software and plan to upgrade it (which they will of course), you get a direct $20 affiliate income. Plus, you also get 10% of the customer lifetime income. Moreover, it doesn’t end here. If you become a super affiliate of Grammarly and start making at least $2000 per month as a Grammarly affiliate, they pay you $200 extra as a flat bonus which is jaw-dropping. To add more spice to your excitement if you start to make $4000 every month you get an extra flat bonus of $400 every month. There’s more inside the box. If you start to make $8000 as an affiliate by promoting Grammarly, you get an extra $800 flat bonus every single month. Earning $8800 every month will change your life, isn’t it? Comment down below what would you do if you start earning an extra $8800 every month. Read | Download Grammarly Keyboard For Android and iPhone. Did you know Grammarly gives you a $25 bonus instantly when they approve your affiliate account? Well, that sounds too good to be true, but it’s for real. Once your affiliate account is approved, all you need to do is put in Grammarly banners on your site and a blog post where you write about Grammarly. The banners are already present in your affiliate account. The best part is, you get the opportunity to earn $25 without referring to any new customers. Excellent Tip: While using Grammarly banners on your website be sure to attach your affiliate links in the banner. This will help you earn affiliate income on autopilot whenever someone buys Grammarly paid plan in the 90 days. Joining as a Grammarly Affiliate and earning thousands of dollars every month is easy if you know how to promote it the right way. Here is the exact step-by-step guide on how to apply for Grammarly affiliate program. Step 1: Click on this special link to go the Grammarly affiliate signup page. Step 2: After clicking on the link sign up for a new account. Step 3: The next step is to add your website details where you’d be promoting Grammarly and your Name, email address, Password, etc. Step 4: Now all you need to do is wait until you get an approval email from Grammarly which will hardly take 3-4 business days to arrive in your inbox. Step 5: Soon after you receive the welcome email from Grammarly it’s time you log in to your affiliate dashboard and select the ready-made creatives to place it on your blog. Grammarly offers over 120+ banners for you to choose from. Step 6: Once you are done selecting the banner, place it on the sidebar of your blog and place your affiliate link in it. Step 7: The final step to get the $25 bonus in your account today is to reply them back with the link of published post and let them know that you have applied the banner on your website too. You’re now all set to promote Grammarly software on your blog and earn hundreds of thousands of dollars every month. 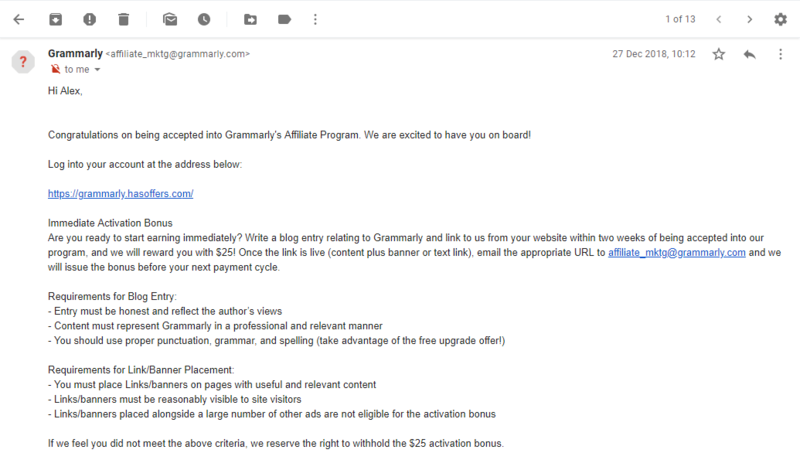 Now that you have got the Grammarly Affiliate approval next question that hits your mind is how the heck can I promote it to earn thousands of dollars every month. I have some cool and working ways to share it with you guys which will do wonders for you. While you promote your affiliate links, you don’t want your readers to feel that that link they are clicking on is a spammy link. Due to this, you need to use a plugin name Pretty Links to cloak your affiliate links and make it look pretty. The second best tip I have for you is to write a detailed Grammarly review on your blog and rank it in Google. People who search on Google have a high purchase intent, and you’ll get a ton of sales daily if you manage to rank on Google or any other search engine. Create a genuine YouTube video sharing your thoughts on what you feel about the tool and how it can help anyone improve their writing. In the description provide your readers a special discount and embed it in your affiliate link. The simple way which you might have already done so far is to place a banner on the sidebar of your blog so if by chance someone who visits your blog if clicks on the banner will have your affiliate code applied automatically for the next 90 days. With different size and format banners, you can try to use Grammarly banners on your entire site and not just the sidebar. Promote it in forums like Reddit or Quora who are genuinely looking for an online proofreading tool. However, this method is hard to scale and won’t make you thousands of dollars every month. NOTE: As you have a time frame of 90 days or 3 months I believe that is enough for you to convert those free signups into paid members. You will get 5 offers in your HasOffers account. Select any of the offers >> copy affiliate link >> cloak it on your blog >> and start promoting Grammarly on your blog. If you are new to affiliate marketing and Grammarly is the first program that you’re promoting as an affiliate in that case you might be having a question in your mind. Well, it’s more simple than counting 1+1=2. On every 1st week of the month (21-22th of the month if you're a ShareASale user), Grammarly releases the payment to all their affiliates. You are eligible to receive the payment after you earn a total of $100 ($50 for ShareASale users). You can receive the payment via wire transfer. Many of the users who have already signed up for Grammarly affiliate and for those who haven’t yet signed up they have several questions which I’ll cover here to make things clear. Yes, you can apply, but it wouldn’t make any sense because you’ll have a hard time promoting the program and eventually getting sales. What I’d suggest is to get some experience in affiliate marketing first and later apply as an affiliate. Having a website is the best way to get accepted for Grammarly affiliate program. However, if you can elaborate your plan on how you wish to promote Grammarly and the approval team finds it useful you’ll get instant approval. Absolutely! You can. But, make sure you have asked your affiliate manager before promoting Grammarly in email newsletters. In your affiliate dashboard, you can track your performance, the number of sales and commissions earned all under the reports section. No, you are strictly restricted to give any additional incentives to your users to signup for Grammarly account. That’s the end of our Grammarly affiliate program review. See, Grammarly is already a popular tool so making $1000+ every month from Grammarly alone won’t be a big deal if you focus on promoting the tool in the right way. So many affiliates are already doing it, and you can do it too. If you have any further doubts regarding the affiliate program of Grammarly, feel free to leave a comment down below and let us know.